The game of golf is not a new tradition in Balfron. There had been a 9 hole course at the top of the village for many years until, in 1939, Balfron Golf Club was dissolved and the land given up for agricultural use during the 2nd World War. In 1991 Balfron Golf Society was formed by a small group of individuals most of whom lived or had been born in the village. A public meeting was arranged to gauge support for a new community venture which would re-create a nine hole course on the site of the original one. Within a few months funding was put in place, the land was purchased and the hard work started with squads of volunteers clearing the grazing land with borrowed equipment and the advice of local expertise. Greens and tees were marked out and prepared for play, some emerging quite naturally from the general lay of the land, bridges built, clubhouse restored and erected and a huge tree planting operation directed by the forestry commission was completed. 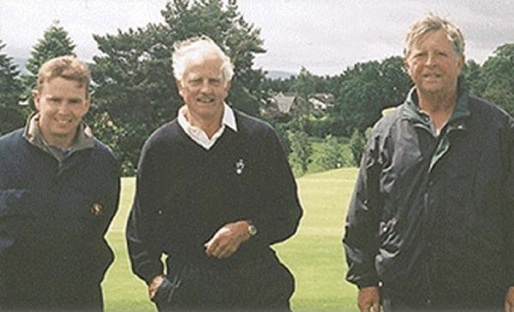 The New 18 hole course was officially opened by Graham Simmers – President Elect of the Royal and Ancient Golf Club, seen here centre, with Allan Mulgrew, the Society Captain, on his left and Robin Hiseman the course architect on his right. The 9 hole course opened on Saturday 4th July 1994. Scince then there have been continuous improvements in the course.The greens have improved consistently year on year and between 1994 and 1997, 3 new greens and 6 new tees have been designed and built. In 1997 the Society purchased adjoining land which meant that the course could be extended to 18 holes. Support was forthcoming from Sports Scotland Lottery Fund, The Foundation for Sport & Arts, The Royal and Ancient Golf Club and the Paul Charitable Trust, a local trust. With funding in place, the new holes were designed and planning permission approved for 10 new holes – the existing 2nd hole was replaced. The plans included a workshop and machine shed and an extension to the existing clubhouse and on the 30th of June 2001 the new 18 hole Shian Course of Balfron Golf Society was opened for play. Since then the society has continued to improve the course and extended the 17th hole, building a new medal tee and a challenging new green which has significantly lengthened the hole. A new practice putting green should come into play in the coming season. The club employs a professional Head Green Keeper, Kevin Wilkie who has a permanent team of 4, and over the summer months the society also normally employs a number students during the summer vacation to assist the permanent team. Course Rangers patrol the course, to provide information to members and visitors and in addition they ensure some catering supplies are available – a service which has been well received by members and guests.